This low noise amplifier provides multiple broadband channels of high signal gain and linearity with low added noise levels, boosting received signals and maintaining system noise figure. 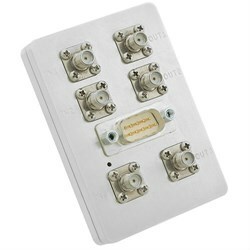 The package itself contains three separate LNAs, and any of the three amplifiers can be independently bypassed via signal control. In addition to the unique set up of 3 independently controlled LNAs, this module offers a wide operating input voltage of +7 to +28VDC. Download the datasheet for more information.